"There was clear focus on the dramatic elements of the play, but rooted in the text itself, which was perfect for the GCSE candidates.” Jonathan Parsons, Tormead School. Whether you're studying Shakespeare, John Ford or JB Priestley, our bespoke practical workshops will get your students up on their feet experiencing these wonderful plays in the spirit they were created. Our team of professional actors and experienced facilitators deliver our workshops bringing a range of techniques from the 'rehearsal room' to explore themes, characters, scenarios and use of language. Ideal for: Students preparing for exams and essays, language exploration. Details: 2 hour workshop £240 (1 hour workshop, £150); up to 30 students (£6.25 per pupil after); one facilitator. 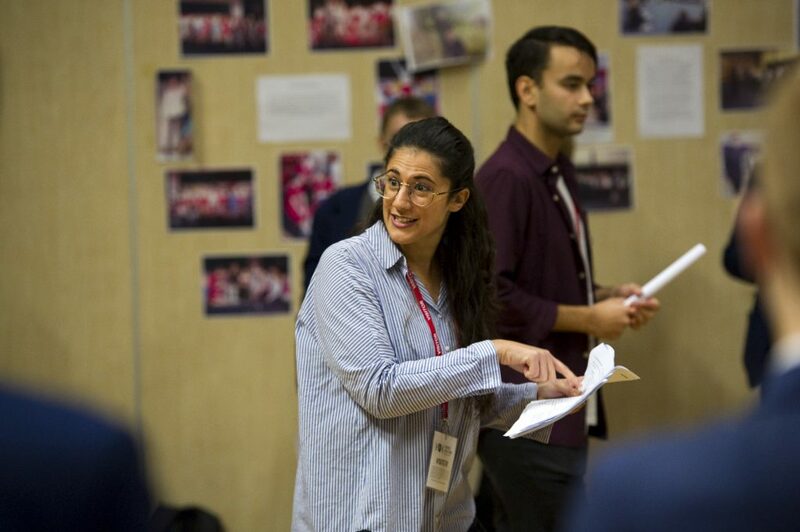 Our professional facilitator will lead your students through a series of practical exercises, designed to explore your selected play’s themes, language or characters of your choice. Exercises will be taken from those used in the rehearsal room to enable participants to practically unlock the text. Ideal for: Large groups, students studying complete plays. Our facilitator explains key quotes and context, as the actors, using the original text, deliver an abridged version of your chosen play. Students take small roles within the performance, acting alongside our professionals, whilst others are invited to redirect the actors in key scenes. The session concludes with a Q&A session with the cast and leader. Ideal for: Introducing Shakespeare to a young audience. Our facilitator presents an interactive, modern language, story-based version of your chosen play. All the children will put a key scene on its feet and perform it to the rest of the group. A great way to encourage multiple groups to engage with Shakespeare's stories and characters, and are popular with add-on workshops. Ideal for: GCSE and A Level students. Our facilitator and actors lead your students through different interpretations of your play’s key scenes. The students perform with the actors to further understand the dynamics of live theatre. Students are also encouraged to direct the actors to fully explore the different possibilities of the play in performance.